This 6-bedroom apartment has been newly refurnished so you will be one of the first tenants living in this apartment. The entrance includes a spacious area which comes furnished with a dining table and a fridge. There is a kitchen which comes fully equipped with everything you will need to cook up a delicious meal. There is 1 toilet and 1 very spacious bathroom. The rooms vary in sizes and features so you can choose according to what you like! 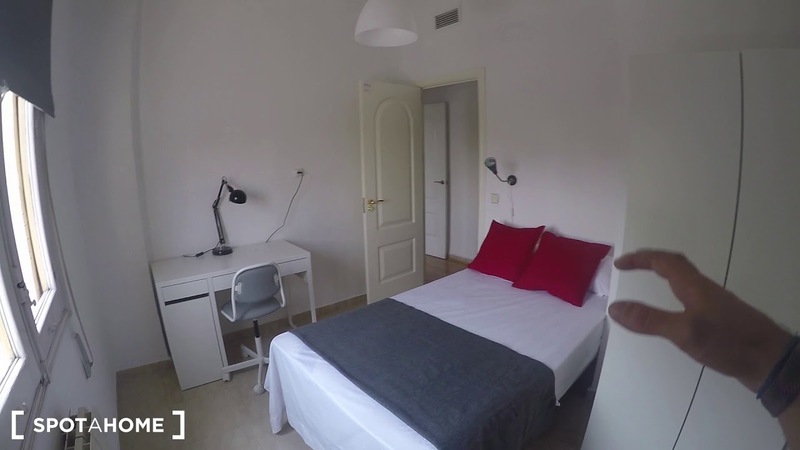 The apartment is located 10 minutes walk away from the Retiro, which is the most famous park of Madrid. Inside, you can visit the Cristal palace or go boating in the pond. There are also several of Madrid's most famous museums around this area such as the Prado, Reina Sofia and Thysssen-Bornemisza. All of them are located very close to one another. There are also several bars and restaurants around the area that you can go to. The apartment was recently refurnished so everything is new. All the rooms have double-paned windows thus the rooms are quiet and the noise from the streets are muted. The location is great since it is located so close to the Retiro. There are really nice museums in close proximity. The closest metro station is Sainz de Baranda. It is located 3 minutes away, by foot and connects to line 6 and 9.